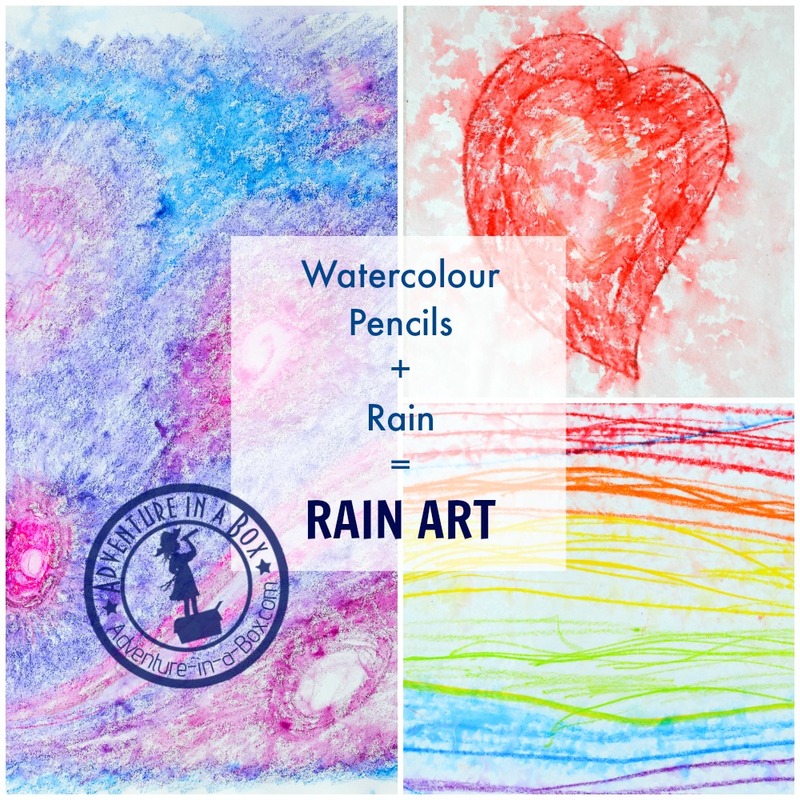 On a rainy day, grab your watercolour pencils and head outside to make rain art together with kids! We have had a lot of rain this month. Not quite what we expected moving back to the prairies, but we certainly aren’t complaining. Every time the rain is over, our garden seems to have grown an inch! And Budster loves digging in the mud, busying himself with it for hours after each rainfall. At first, I saw the idea of rain pictures over at Nurture Store. Despite the best attempts of meteorologists, rain seems to come and go unpredictably. So when it started to rain, we began to look hastily for things to paint with, not sure how long it would last. 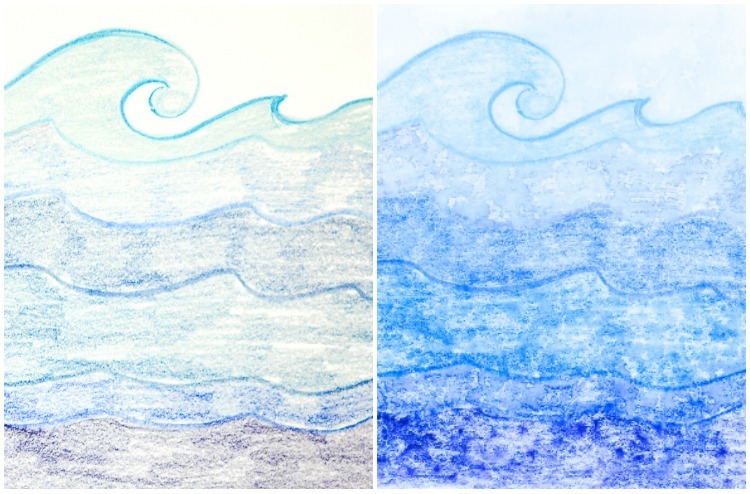 Instead of watercolours, we found a box of watercolour pencils, and that’s what we used for collaborating with the rain. 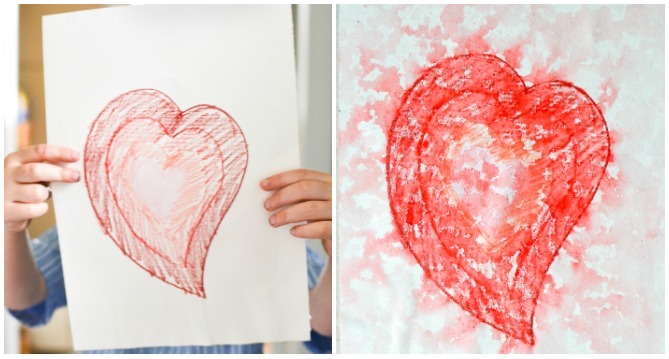 We experimented with paper, trying heavier and lighter paper. It didn’t seem to make any difference, so we ended up drawing on the cheapest paper available and not feeling too bad about showering sheet after sheet with water. When drawing, my preference was to cover the whole page. Budster didn’t think it necessary. He was usually anxious for results, so he would make several hasty squiggles and run to the porch. 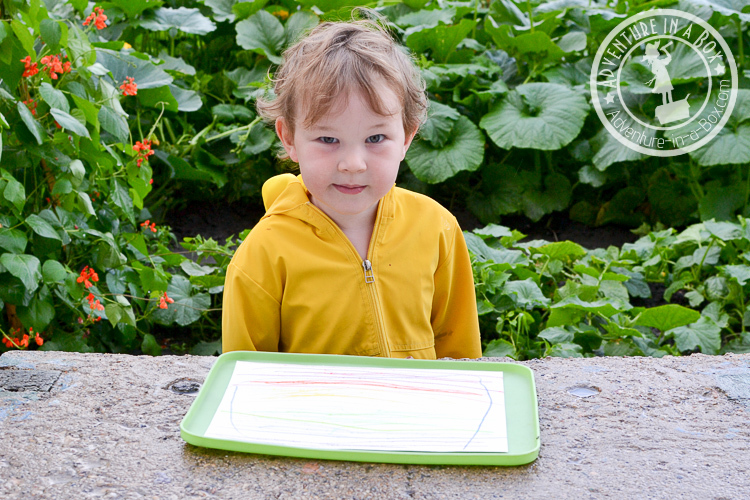 Here he was drawing raindrops. This picture followed several others, so he took his time drawing the stripes of the rainbow and filling them in. 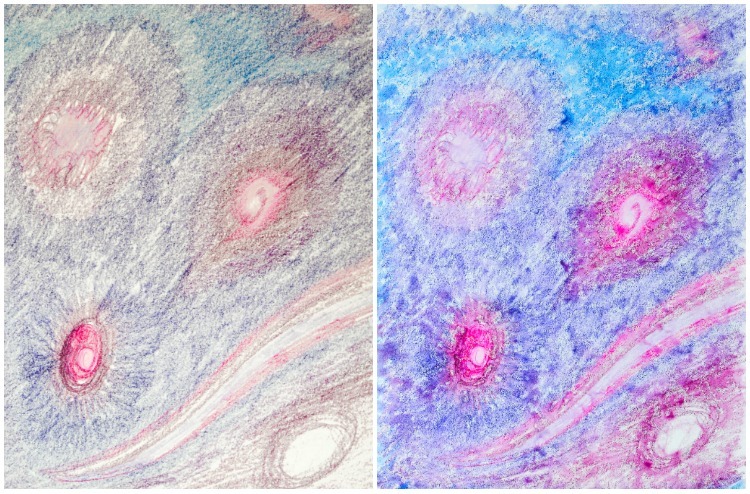 We offered our drawings to the rain on our back porch, so that we could sit in shelter while watching the raindrops leaving little splotchy dots behind and gently mixing the colours together. When a tray was handy, we used it, but mostly we put the pictures right on the cement. When it was windy, we secured the corners of the picture with handy wood scraps. Once the colours would get enough water, we took pictures back inside and let them dry. All this running in and out in the rain sure was refreshing! It really was interesting to see the result, so we enjoyed doing it many times over the course of several rainy days. We tried making pictures under light drizzle and under heavy rainfall which absolutely soaked us in the ten seconds that we were outside. The light rain worked better, gently smearing the paints together and leaving a dotty pattern behind. Heavy rain drove the pigments off the paper, leaving the picture a bit faded. The overall result has an impressionist feel, as if accomplished by pointillism. When Budster is older, it may be fun to do it while when discussing art movements. For now, we’re just eagerly awaiting the next rain. 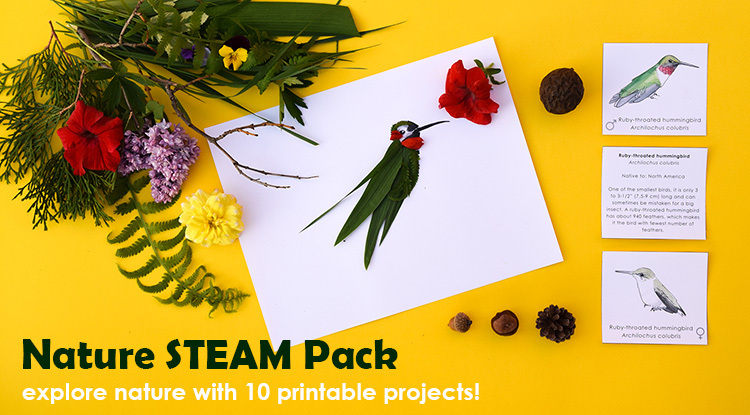 Have some fun right in your backyard with our nature STEAM bundle! Children will learn about nature while playing games, completing engineering challenges, going on scavenger hunts, and making art with natural materials.